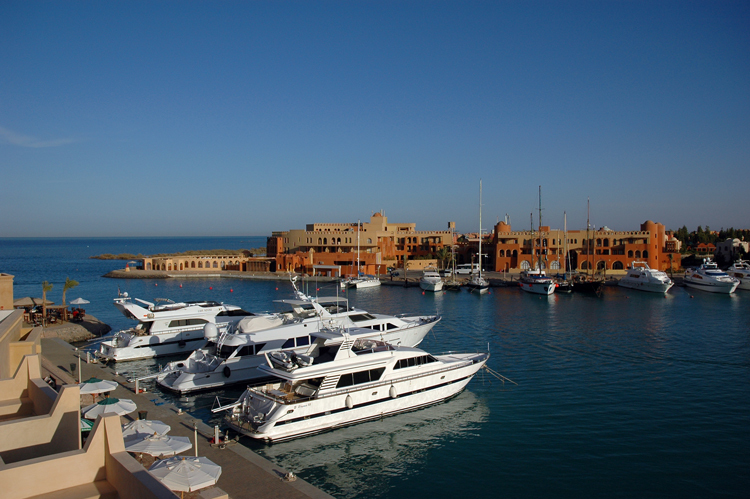 One of your final treats in your voyage up the Red Sea is a stop at Abu Tig Marina. 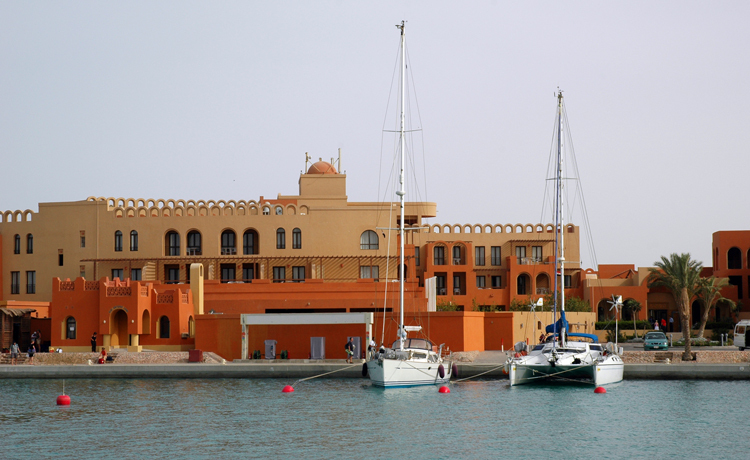 This resort community is your last port of call before you sail up the Gulf of Suez to enter the Suez Canal. Abu Tig is the perfect base from which to stage your Egyptian adventures. The Marina has a Mediterranean flavor and is extremely secure. The cost was $150 per month when we were there. They charged $15 per day for the first ten days, and after that the rest of the month was free. 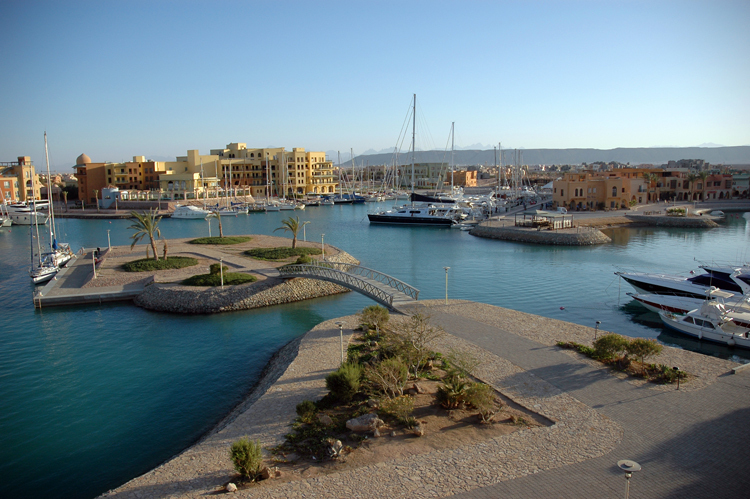 Surrounding the Marina is a designer village with beautiful restaurants and shops. Each night you can eat at waterfront restaurants overlooking the harbor. As an added bonus, the Sailmail system has a transmitter at Abu Tig. If you are behind on your correspondence, you can instantly log in via pactor to send and receive mail. You'll never find a place where it's easier to log into the system. Abu Tig is a gated community several miles long with condominiums, houses, and resorts for thousands of visitors who come for water sports and to tour Egyptian antiquities. Because it's so secure, yachties can leave their boat when they do a Nile River cruise. It's so inexpensive that some sailors even winter over there. Abu Tig is one of the best kite boarding destinations in the world. 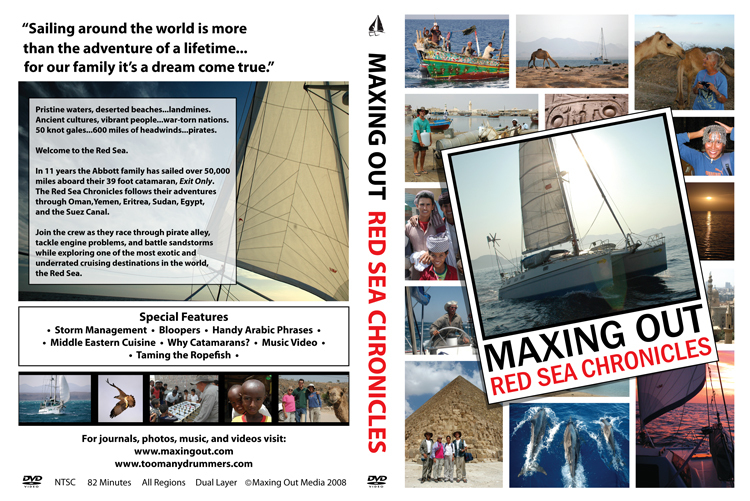 A wind compression zone funnels strong breezes down the Gulf of Suez blasting resorts with predictable wind. There can be upwards of fifty inflated kites lining the beach on any one day. Professional kite boarders put on mind boggling displays in the fifteen to twenty-five knot winds. I spent four days photographing airborne dare devils as they took to the air. Abu Tig has it all, and I suspect it won't be long before it will be discovered by eastern Mediterranean sailors who are looking for a great place to winter over. When it comes time to head 180 miles north to the mouth of the Suez Canal, you need a weather window to avoid a hard slog to windward. 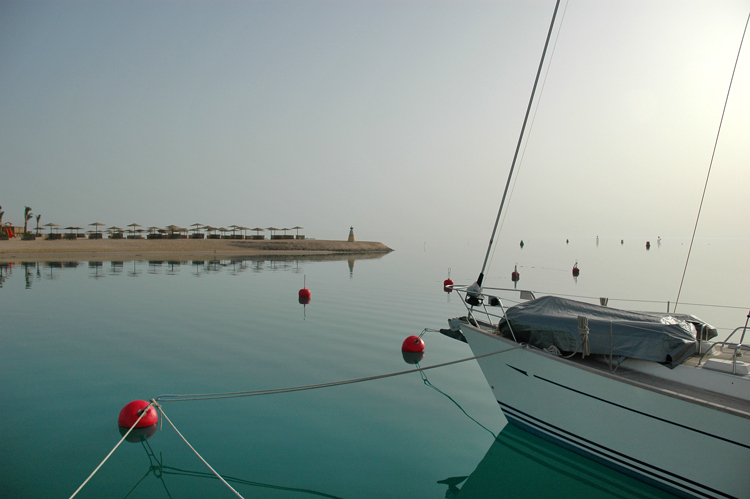 On this particular day, the Red Sea is flat calm. Now that is a weather window!